This is the second part of the discussion begun in the last post regarding “rules” of composition. As explained in the last post (Part 1), these “rules” should not be perceived as inflexible laws but rather as guides intended to help artists to arrange their subject material in artworks. After all, to make an artwork eye-catching, artists need to deviate from conventional arrangements underpinning the “rules” and add an element of surprise (i.e. an unpredictable element breaking the “rules”). 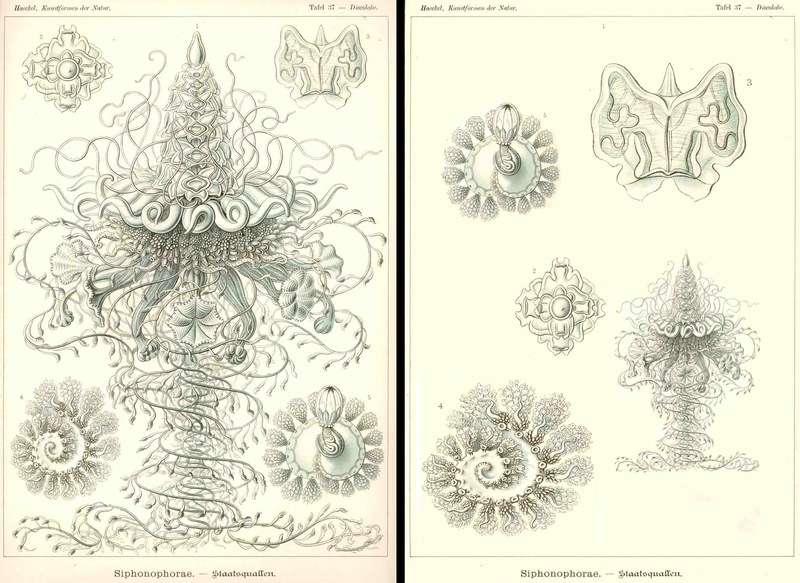 To sustain the same approach to the discussion as in Part 1, I will again use Ernst Haeckel's scientific illustrations as the focus for the explanation. Rule #6: avoid creating uninterrupted lines across an image (i.e. where the featured subject creates a conceptual bridge spanning one side of the image to the next, such as an horizon line that has no subject breaking its continuous line). 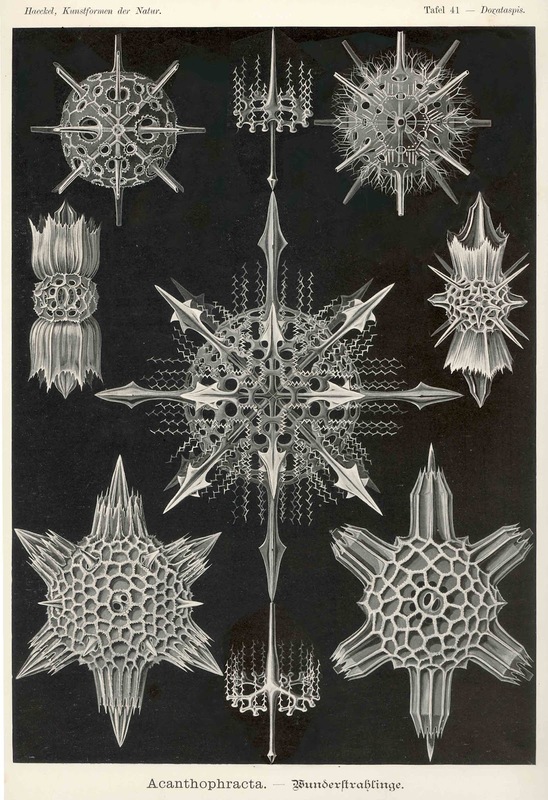 In Haeckel’s Acanthophracta—Plate 41 (shown below) the radiolarians are all arranged with black space surrounding them. Consequently, there are no uninterrupted lines to be seen that might otherwise break the composition into separate components. 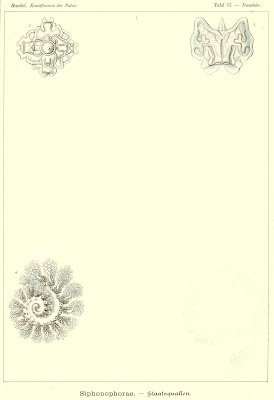 For instance, if some of these delicate forms were rearranged to create a continuous line wherein they “touch” each other as well as two sides of the image’s border (as shown in the digitally altered image further below for example) then the viewer’s eye is drawn to the uninterrupted line they create. In the case of this altered image, the eye then reads the division in the image as producing two sections; each of which are united with the other but at the same time both are examined by the eye as separate pictorial zones. In short the cohesiveness of the image is diminished. Condition: there is a crease on the lower corner well away from the image. 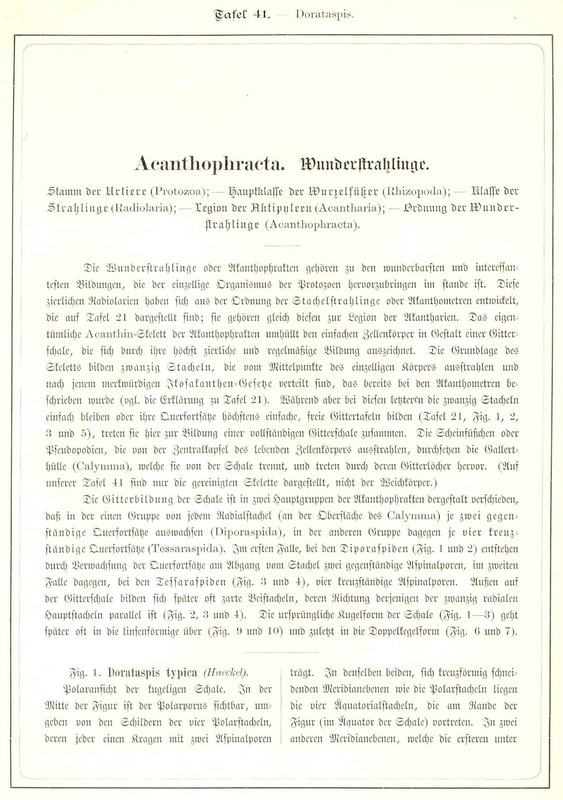 I am selling this print (Acanthophracta—Plate 41) and the print below (Siphonopharae—Plate 37) along with their accompanying sheets of explanatory text for a combined total cost of $137 AUD including postage and handling to anywhere in the world. (Note: these are large prints and will be shipped in a tube.) Please contact me using the email link at the top of the page if you have any queries or click the “Buy Now” button below. 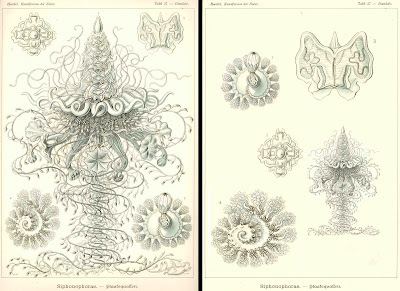 I am selling this print (Siphonopharae—Plate 37) and the print above (Acanthophracta—Plate 41) along with their accompanying sheets of explanatory text for a combined total cost of $137 AUD including postage and handling to anywhere in the world. (Note: these are large prints and will be shipped in a tube.) Please contact me using the email link at the top of the page if you have any queries or click the “Buy Now” button above. 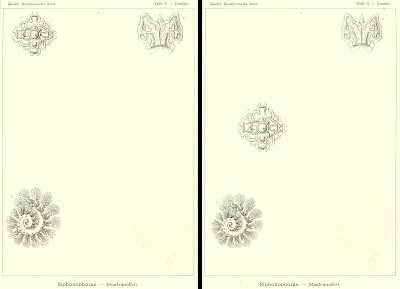 To extend this process of elimination a stage further, in the second altered image of Siphonopharae—Plate 37 shown below, the number of subjects is reduced to just three forms and the eye has less of a problem choosing a centre of interest—to my eye the lower left Siphonopharae. In short, the odd number of displayed subjects allows the viewer to select a centre of interest by establishing one of the forms to be the most interesting in a hierarchy of visual importance (i.e. by a perceptual “pecking order”). Rule #8: avoid creating a “floating” composition (i.e. do not position a subject so that it is unattached to the outside border of the image or in a way that does not conceptually relate to the border). 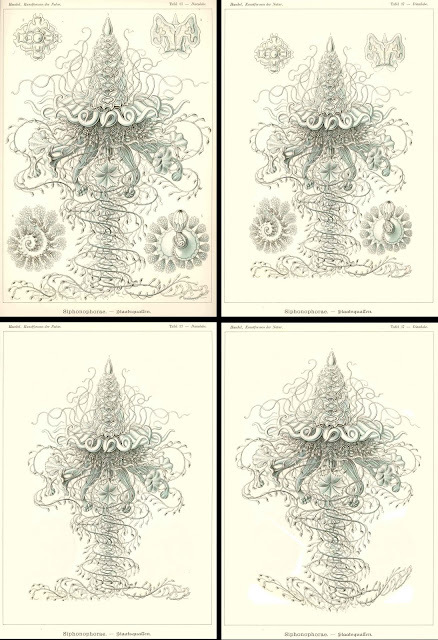 For example, if I revisit the composition of Haeckel’s Siphonopharae—Plate 37 and digitally “float” the portrayed forms with additional space surround them as a group, as shown below (see upper-right image), the relationship between the forms and the borderline of the format becomes more “free” compared to the original print (see upper-left image). By this I mean that an element of visual uncertainty is introduced into the composition as to the spatial position of the forms—to my eyes they are further away in this fresh arrangement. Moreover, there is also a leaning to ambiguity with regard to the meaning projected by the new composition—to my eyes the forms are not as structurally solid compared to how they appear when juxtaposed close to the straight edges of the border as in the original print. If I then digitally remove all but the central Siphonopharae from the composition (see lower-left image) the relationship between the borderline and the portrayed subject becomes more tenuous. 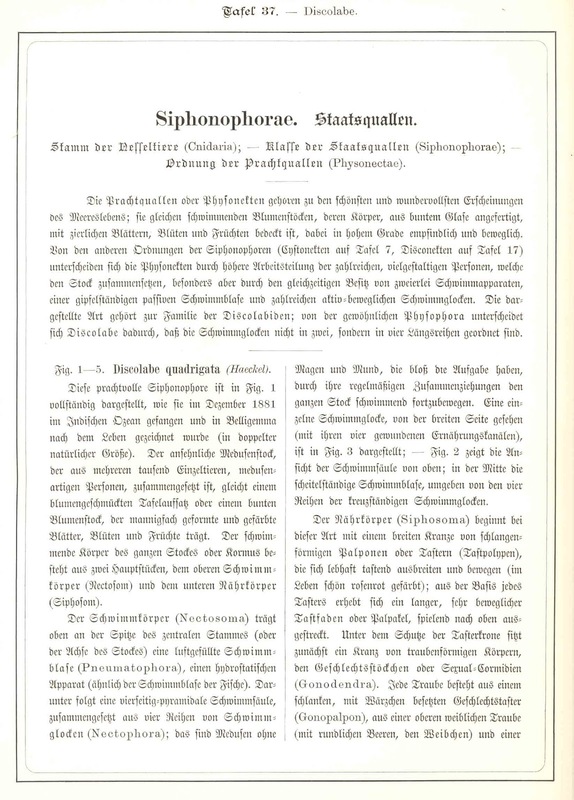 This is because the removal of the Siphonopharae from the corners of the composition makes the arrangement less formal and rigid. 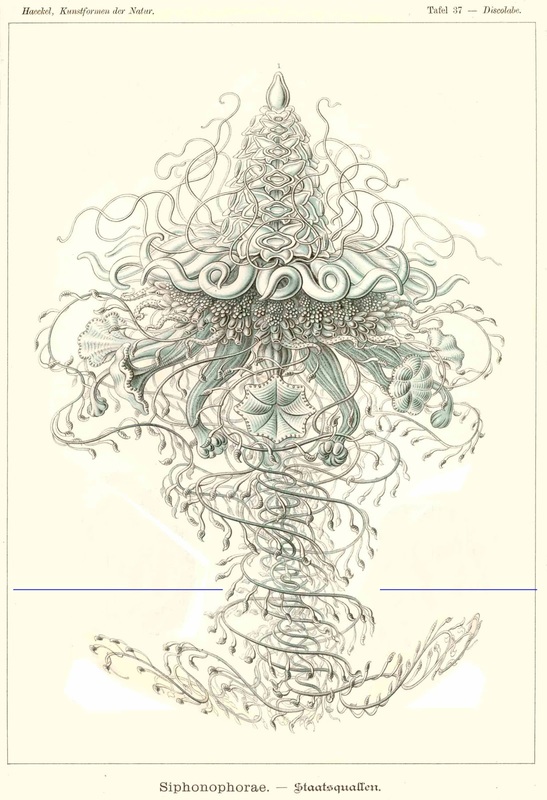 As a final experiment, consider how the relationship between the border and the central Siphonopharae breaks down even further if the subject’s form is distorted (see lower-right image) so that it could be framed with formats other than a rectangle (e.g. an oval or a diamond-shape). At this stage the compositional link between subject and the image shape is lost by the effect of a perceptually floating subject. The addition of a single line connecting the subject to the borderline, however, can “fix” the problem and give compositional cohesiveness back to the image as can be seen in the adjusted image below. Rule #9: avoid creating an unbalanced composition (i.e. 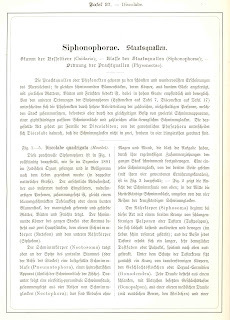 do not position the subject material so that it is aesthetically too “heavy” on the top or sides). Usually artists seldom create unbalanced compositions because intuition and years of developing a “good” eye for aesthetics guides judgements regarding balance. Rather than resorting to the tried and tested approaches to test whether a composition is balanced or not (e.g. looking at the artwork in a mirror to give a fresh viewpoint—there is even a tradition of looking at artworks by turning your back to them, bending over, and then examining them from the unusual viewpoint of between your legs) I wish to discuss the more delicate approach of using the centre-of-interest as a fulcrum point to avoid an unbalanced composition. 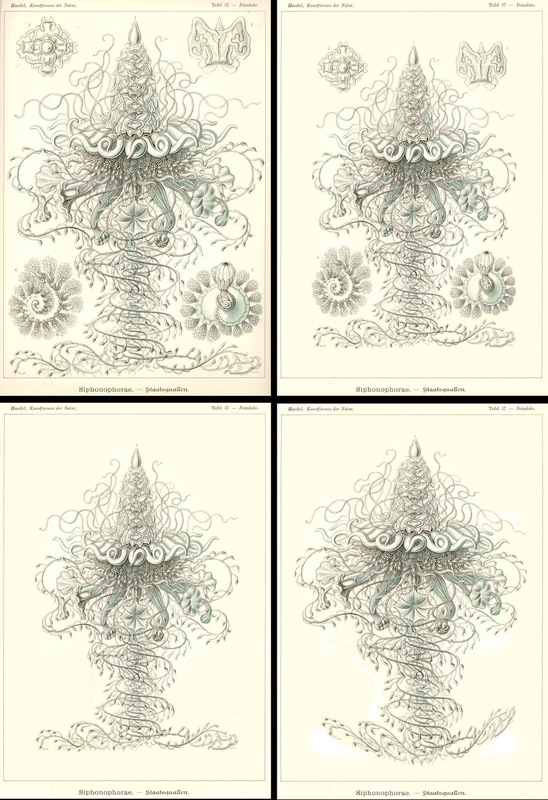 In the earlier adjustment of Siphonopharae—Plate 37 showing the effect of using only three featured subjects (see the left image below) the composition displays a visually unsettling top-left weighting. One way to address this aesthetic problem is to shift the upper-left Siphonopharae to a position where it acts like a fulcrum (i.e. the pivoting point) of a child’s swing to aesthetically balance the two other forms. In the right image below, I have selected such a point that I feel is aesthetically “right” for balancing the visual weights of the lower-left and the upper-right forms. Of course there are many other such positions and there will be many viewers with a much more refined sense for locating the exact “sweet spot” for placing this subject. Rule #10: avoid creating equal sized spaces between subjects (i.e. do not position a subject midway between two others). 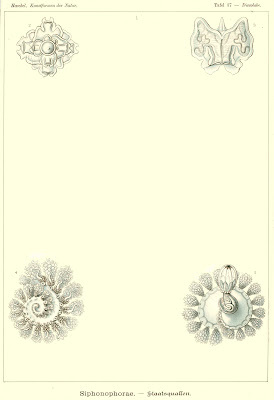 Of all the issues relating to composition in Haeckel’s prints this “rule” is the one that Haeckel has chosen to ignore, but with good reason. In scientific illustration the purpose of the artwork is to show the subject in a way that can be understood objectively as a specimen. 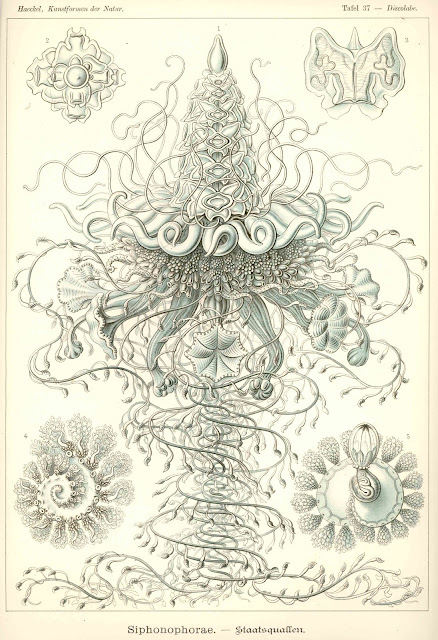 This means that the artist’s role is not directed to showcasing a very personal view of it (even though Haeckel’s artwork is far from lacking a clear style). 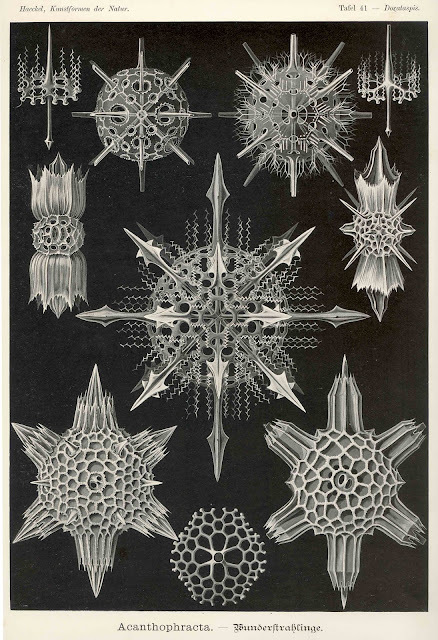 Mindful of this aim, Haeckel’s images are constructed using symmetry of equal sized spaces. 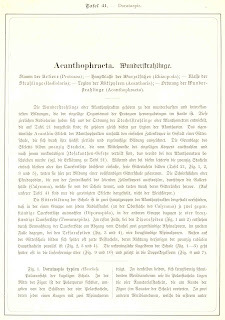 Nevertheless, to demonstrate the effect of changing this symmetry with subjects arranged with uneven spaces separating them the digitally adjusted image below of Siphonopharae—Plate 37 may be of interest. 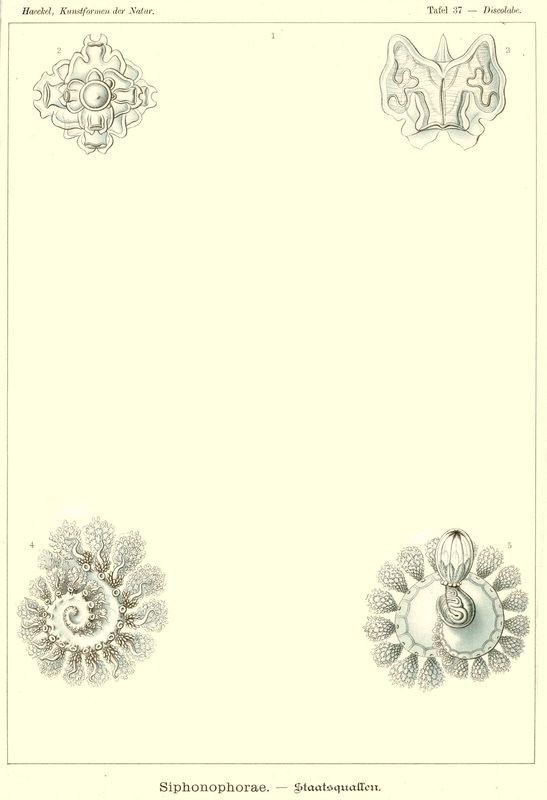 Of course the creation of these unequal sized spaces raises the question in scientific illustration concerning rule #8: avoid creating a “floating” composition.